by Laura-Ellen McKinney. Judson Press, 2005. Lora-Ellen McKinney is the daughter of a third-generation Baptist minister and an expert in community health, social services, social justice, and education. She consults on issues of conflict and dispute resolution and has written several books for African American congregations. 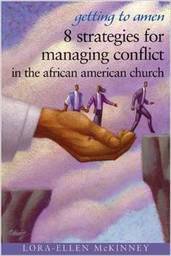 This book addresses some of the unique characteristics of conflict in African American congregations. An early chapter gives an overview of eight strategies for managing conflict: prayer, preaching, parishioner awareness, perspectives on problems, practical solutions, programs and premises, pastoral management, and promises. The second section of the book discusses five topics that commonly cause African American congregational conflict: women in leadership, homosexuality, church migration, politics in the pulpit, and non-denominationalism. The closing section outlines a hopeful and collaborative future. Appendices include case studies and numerous resources. African American congregations will benefit from McKinney’s compassionate and knowledgeable straight talk, and any congregation conflicted about those specific issues will benefit as well.